A scientist at the U.S. Army's biodefense laboratory at Ft. Detrick, Maryland, performs PCR analysis on anthrax samples. first applied to basic science research and later revolutionized modern medicine by improving the diagnosis of human diseases through enhanced genetic testing and medical research. More recently, PCR technology has significantly contributed to both domestic and international forensic sciences as well as applications aimed at improving United States homeland security. PCR requires specialized equipment that is customized to fluctuate between specifically timed temperature variations. Before PCR is performed, DNA must be isolated from peripheral blood, hair follicles, cheek cells, or tissue samples. Isolated DNA is double stranded, meaning that there are two sequences of letters or nucleotide bases (A or adenine, G or guanine, C or cytosine, and T or thymine). The double stranded DNA is held together by complementary base pairings in that A binds to T, C binds to G and vice versa. Therefore, knowing of the sequence of one strand will reveal the sequence of the complementary strand. Amplification is necessary because there are 3.9 billion bases, and although there is a lot of total DNA, there is not enough to properly analyze specific gene or gene segments. Amplification, therefore, makes it possible to obtain ample quantities of specific sequences of DNA to perform a variety of analyses. PCR requires "primers," or two sequences about 20–25 bases long with one binding to the beginning sequence of interest and the other binding at the end of the same sequence. In order to get the primers to bind to the targeted sequences in the genome, the PCR machines will undergo several cycles at different temperatures. In the first cycle, the DNA is heated to break apart the two strands. The temperature is then reduced so that the primers can bind or anneal to their complementary base sequence in the DNA. Finally, an enzyme called Taq polymerase adds letters from a pool of bases or letters included in the reaction to the position next to the last base of each the primer. Synthesis of one strand of DNA is in the opposite direction of the other. The result is a double stranded DNA sequence. These cycles are repeated several times and amplification of first the DNA sequence in the genome is copied and this copied DNA is re-copied in the next cycle resulting in exponential growth of the specific sequence. Thirty cycles amplified the target DNA between 100,000- to 10,000,000-fold. However, only DNA sequences of 100 to 2000 bases long are ideally suitable for PCR amplification. In this way, a gene of interest or part of the gene can be amplified to quantities that make genetic studies possible. PCR, therefore, is rapid, inexpensive, and a relatively easy way of producing a large number of copies of a specific DNA sequence. This is particularly advantageous when there is very little or poor quality DNA. RNA, which is converted from DNA into protein, can also be amplified in the same manner as DNA, however, DNA is much more stable and is easier to isolate. Since each individual inherits sequences of DNA that are different from other individuals, the importance of DNA and PCR technology in identifying an individual is exemplified in the courtroom. DNA analysis can be a powerful tool in criminal investigations, especially those classified as homicides, theft, and sexual assault. Physical evidence left at the scene of any crime can be helpful in reconstructing the sequence of events and potentially reveal the criminal. It can also reveal non-paternity if the pattern of DNA in the offspring does not match the pattern of DNA in the assumed father. Forensic science relies heavily on PCR technology to amplify specific sequences of DNA that will establish a connection between a specific suspect and a crime scene. Amplification of DNA is critical in cases where the source of DNA is minimal or the integrity is compromised. DNA evidence is also a powerful tool that has been used to ultimately prove the innocence of previously convicted individuals. Additionally, DNA can reveal many characteristics that can help forensic scientists and law enforcement officers identify the perpetrator. This is becoming increasingly applicable to national security as well as international intelligence. PCR has revolutionized law enforcement in this way and will continue to enhance the justice system in the future. For example, using complex algorithms and known sequences of DNA, it is possible to analyze the genetic DNA pattern from an unknown person to predict eye color, gender, and even ethnicity. In 1985 American geneticist Alec Jeffereys, Ph.D. used PCR technology to amplify regions in the human genome that were highly variable. These DNA fragments were comprised of specific sequences that were repeated. The repeat number was found to be highly variable from individual to individual with the exception of identical twins. These DNA fragments could be amplified using PCR and then studied for variable fragment lengths of repeats. This technology was collectively referred as genetic fingerprinting and became widely used. In a highly publicized case called the Narborough Murder Enquiry, criminal investigators were able to identify the perpetrator using DNA fingerprinting. One of the more recent applications of PCR technology is for improving national security. After the September 11, 2001 terrorist attacks on the United States, the fear of further attacks involving biological weapons increased. Rapid identification of terrorists and specific biological agents using PCR-based methods represents a plausible approach to gathering critical information about these individuals and weapons. With the identification, characterization, and genetic engineering of viruses, bacteria, and fungi, the likelihood of strategic, harmful applications involving these organisms is growing. Biological species that represent a serious health risk to humans have been used as weapons for years. These risks can include the U.S. agricultural economy, food supplies, and the environment. To combat bioterrorism, President George W. Bush in February 2002 called for a budget increase to $5.9 billion for Homeland Security directed towards protecting against bioterrorist attacks. The creation of a national database that catalogs pathogens and individuals that are authorized to study these pathogens is also of ongoing concern. A benefit of these databases would be to identify the genetically engineered pathogens used as biological weapons (allowing quick access to specific medical treatment protocols) and to potentially link pathogens to the bioterrorists that developed them. PCR technology can also be employed to identify the specific disease-causing microorganism. The U.S. Postal Service is working in conjunction with the biotech industry on initiatives to develop intelligent mail. Using PCR to identify anthrax, for example, is one way to quickly ascertain the nature of the contaminated mail or screen high-risk mail. This technology was the government's primary weapon against mail deemed unsuitable for circulation since irradiation provided a limited, unsubstantial solution and often damaged the mail. This high-tech strategy for mail surveillance can be particularly useful by sucking out air samples from the mail and testing for specific molecular signatures using PCR to detect a possible biological contaminant. Defending against bioterrorism after the September 11 attacks includes developing advances in biological detection instrumentation. In conjunction with the Centers for Disease Control and Prevention (CDC), Lawrence Livermore National Laboratory and its sister laboratory at Los Alamos are currently developing DNA profiles of the most threatening pathogens such as anthrax and the plague using PCR technology. Biodetection instrumentation for genetic profiling has led to the miniaturization and subsequently the portability of DNA analytical devices, particularly for PCR. Forensic scientists and criminologists also benefit from mobile PCR machines by bringing the science to the scene of the crime leading to more rapid crime-solving capabilities. Security at the 2002 Winter Olympic Games in Salt Lake City was led by The Biological Aerosol Sentry and Information System (BASIS). 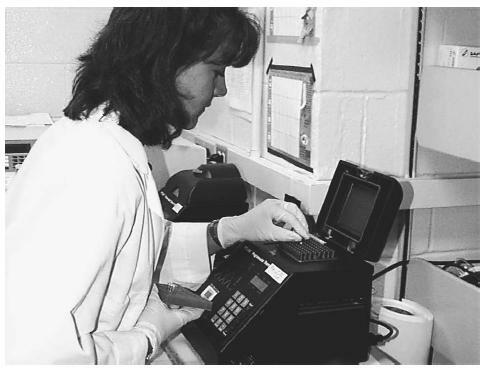 Miniaturized PCR machines called Smart Cyclers developed by a company called Cepheid were used at the field laboratory operation set up by BASIS. The purpose was to prepare for a bioterrorism threat by having appropriate and rapid biological sample identification to allow for accurate bioterrorist assessment and validation so that the proper responses could be executed. Recent concerns over genetic engineering of agricultural food products and the potential risks to food safety have prompted studies investigating the molecular signatures of crops using PCR. A study in the scientific journal Nature revealed that genetically manipulated DNA from industrial produced maize had been introduced into corn fields in Oaxaca, Mexico. Although the ramifications to health and food safety are unknown and most likely benign, surveillance of crops using PCR is a formidable approach in the implementation of security measures to help protect against harmful pathogenic contaminations that can threaten food safety. As the cost and use of PCR are eased and as the collection of databases with recognizable DNA profiles of various microorganisms is increased, the utility of this technology in human and food safety will be greatly improved. Friedman, J., F. Dill, M. Hayden, and B. McGillivray. Genetics. N.P. : Williams & Wilkins, 1996. Lodish, J., D. Baltimore, A. Berk, S. L. Zipursky, P. Matsudaira, and J. Darnell. Molecular Cell Biology. New York: Scientific American Books, 1995. Jeffereys, A. J. "Hypervariable 'minisatellite' regions in human DNA." Nature no. 314 (1987): 67–73. Mullis, K. B., and F. A. Faloona. "Specific synthesis of DNA in vitro via a polymerase catalysed chain reaction." Methods in Enzymology no. 155 (1987): 335–350. Nakamura, Y., M. Leppert, P. O'Connell, et al. "Variable number tandem repeat (VNTR) markers for human gene mapping." Science no. 237 (1987): 1616–1622. Quist, D., and I. H. Chapela. "Transgenic DNA introgressed into traditional maize landraces in Oaxaca, Mexico." Nature no. 414 (2001): 541–3. Wong, Z., V. Wilson, A. J. Jeffereys, et al. "Cloning a selected fragment from a human DNA 'fingerprint': isolation of an extremely polymorphic minisatellite." Nucleic Acids no. 14 (1986): 4605–616. Wyman, A. R. and R. White. "A highly polymorphic locus in human DNA." PNAS no. 77 (1980): 6754–6758. Access Excellence. "Kary B. Mullins." The National Health Museum. March, 2002. < http://www.accessexcellence.org/AB/BC/Kary_B_Mullis.html > (December 13, 2002). Access Excellence. "PCR Technology." Connie Veilleax. July 8, 2002. < http://www.accessexcellence.org/LC/SS/PS/PCR/PCR_technology.html > (December 16, 2002). Center for strategic and international solutions. "New Technology Counters Bioterrorism Threat, Policy Issues." CSIS. Fall, 2002. < http://www.csis.org/pubs/prospectus/02fall_bacastow.htm > (December 11, 2002). Edvotek. "Biotechnology: DNA Fingerprinting for Forensics and Paternity." 2001. < http://www.edvotek.com/experiments/biotech/04/334.html > (December 12, 2002). Government Security. "Who are you?" Technology solutions in defense of the homeland. July 22, 2002. < http://govtsecurity.securitysolutions.com > (December 15,2002). Kari Sable Burns. "Green River Killer." True Crimes. 2002. < http://www.karisable.com/greenriverdnatime.htm > (December 15, 2002). United States Congress 107th Congress 2nd Session. "Technology assessment in the war on terrorism and homeland security: the role of OTA" Committee Print. April, 2002. < http://www.fas.org/irp/congress/2002_hr/ota.html > (December 15, 2002). Westburg. "Human Diagnostics: forensics." Cambridge Molecular Diagnostics. 2001. < http://www.westburg.nl/htm/md/hd_forensics.htm > (December 15, 2002).